Jordan McNair died of heat stroke. 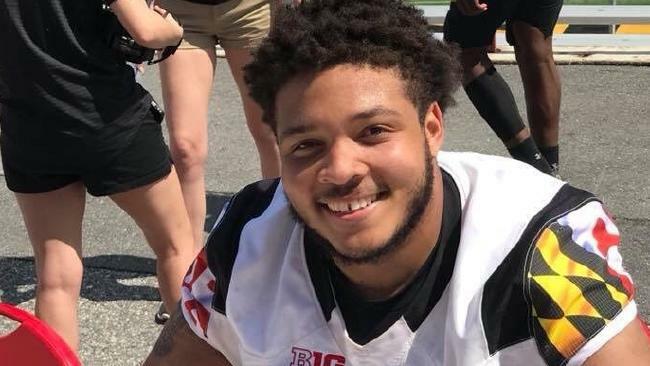 OFFICIALS at America's University of Maryland are accepting blame for the death of football player Jordan McNair, more than two months after they say their athletic training staff failed the first-year student. 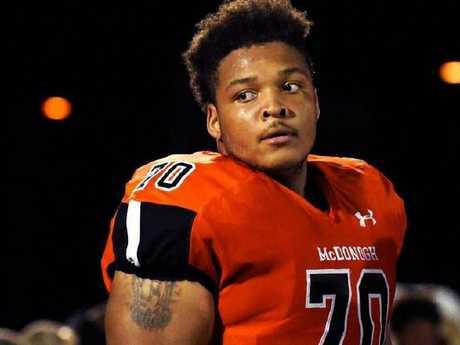 The 19-year-old offensive lineman died in June, two weeks after he collapsed suffering from heat stroke during an organised team workout and was hospitalised. "The university accepts legal and moral responsibility for the mistakes that our training staff made on that fateful workout day," Maryland president Wallace Loh said at a press conference on campus on Wednesday (AEST), hours after he and athletic director Damon Evans met with McNair's parents to share the same message. "Based upon what we know at this time, even though the final report is not completed, I said to the family, 'The university owes you an apology. You entrusted Jordan to our care and he is never returning home again.'" The school is still conducting a review of McNair's case and its athletic training protocols, That review is expected to be finished and made public in mid-September, but has already concluded from "preliminary observations" that the situation was mishandled. Evans said the school had parted ways with head strength and conditioning coach Rick Court, who later posted a resignation letter on Twitter. Multiple reports said the two sides reached a financial settlement. The university was at fault for Jordan McNair's death. Head coach DJ Durkin remains on administrative leave while the university launches a separate independent investigation into allegations of bullying and a toxic culture inside the football program - including the fatal workout. That investigation began only last week after an ESPN report on the program. "I want to be clear that I have not witnessed any behaviour as what was described in the media, but it is essential that we fully review these allegations," said Evans, who was named the full-time athletic director in July and has served as the administrative liaison for football. "I believe I'm the one that can lead us through these very difficult times." As the program awaits those findings, with the Terrapins' season opener just 17 days away, Loh and Evans detailed the mistakes made by Maryland's training staff that preceded McNair's death. 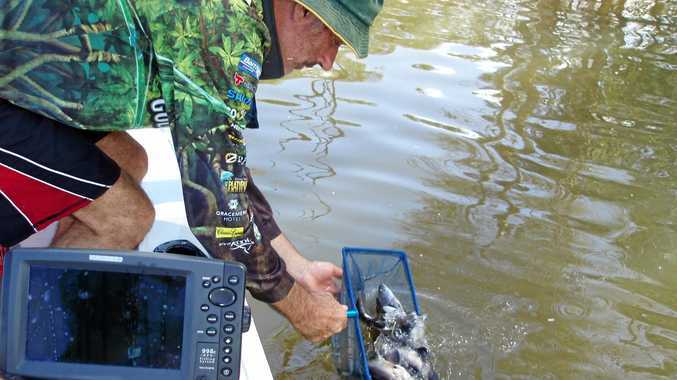 Evans said that "heat illness was not promptly identified or treated", McNair's temperature was not taken and the staff did not apply a cold-water immersion treatment. Ultimately, these failings caused McNair's death. "Some of the actions of our athletic training staff - not the coaching staff, the athletic training staff - they basically misdiagnosed the situation," Loh said. "No vital signs were taken, other safeguard actions that should have been taken were not." McNair's parents, through a statement released by their lawyers, expressed their appreciation for Loh and Evans' visit and Maryland's acceptance of responsibility. "While Marty and Tonya will never get another day with Jordan, Dr Loh's words were meaningful to them and give them some comfort that he will put the university on the path to change the culture of the program so that no Terrapin family will have to endure the heartache and grief that they feel," the statement said. Athletic director Damon Evans has apologised to McNair’s parents. 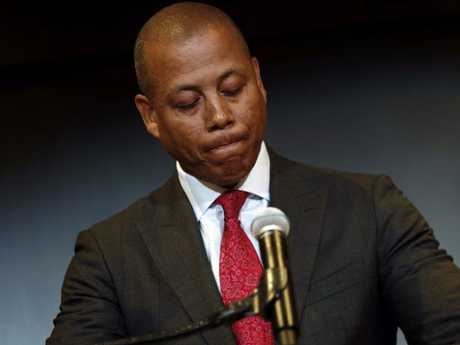 Writing about the events for Sports Illustrated, Andy Staples was surprised at the honest admission of guilt, saying: "In these days of deflection and whataboutism, the words coming out of the mouths of Wallace Loh and Damon Evans … sounded shocking. "We've become so accustomed to these kinds of officials spinning, obscuring and covering up that it seems stunning when they actually come out and say, 'We screwed up.' But that's what Maryland's president and AD did." Barry Svrluga of the Washington Post criticised Maryland, after Wednesday's revelations, for failing in its primary duty to care for its students. "It's completely jarring to hear such a simple equation: Had Maryland officials taken McNair's temperature when he first collapsed, he might be alive," he wrote. "Had Maryland officials been prepared to immerse a player with symptoms of exertional heat stroke in ice-cold water, he would be alive. They did neither. So he's dead.